RV stands for Variable Resistor, and also called POT (potentiometer), so yes RV is POT. Of course, you can use 9v battery. I am working on this project with a friend and we cannot get it to work properly. We believe the photo diode isn't picking up the IR signal. Any feed back as soon as possible would b greatly appreciated. Its a very simple circuit and should work without any issue. Try to adjust Variable Resistor or replace the component which you believe to be faulty. Now we got the circuit to properly to work with a LED in place of the buzzer. However, when the buzzer is in the normal place and movement moves across the photo diode; the buzzer turns on and stays on. Any ideas? Can i use LDR in replacement to photo diode?? Im not sure but the ckt i assembled was consistently buzzing only. No, you have to use Photo Diode to detect the IR radiation. @lenin @Akash Try adjusting the variable resistor RV1. 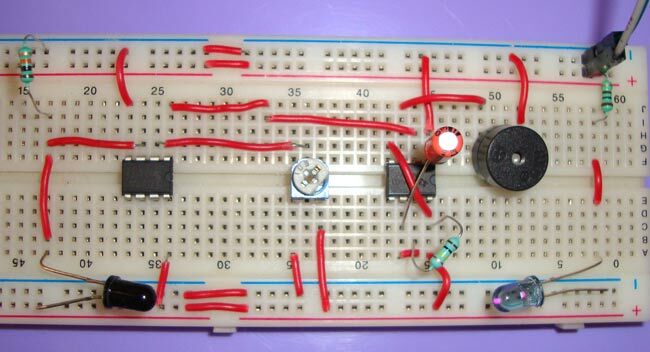 Circuit is quite simple, just follow it, this will work for sure. Also check connections with LM358 IC. The circuit is very simple , easily done ...thanks admin keep posting more..
thank you. its working for me. I want t extend this project. Instead of using a buzzer, I want this circuit to send a sms alert. So how can I proceed. 555 timer ic is heating. So and not working circuit so you can Gide me? If I want to buy this exact kit does any know where I can do this from? sir , instead of buzzer , I wanna insert relay , can I increase the time period of trigger state ?? yes you can do that just by changing the value of RC i.e resistor and capacitor. Please suggest suitable values of RC and driver circuit to drive a 5V relay at the output which will be used to open a solenoid valve of a tap. I just noticed that the IR led has the value of 10K different from what is in the circuit which states 100 ohms only, apparently the photo diode is connected to 100 ohms instead of 10k.. ur schematic and actual photo shot of the circuit didnt match..
that's maybe why i can't make the circuit work. will the beeping gets higher when the obstacle comes close? if no what should be done to vary the beeping as he object moves closer to the reciever? this will for ac voltage . What should I do if I want the circuit to be effective if I have a distance of 20 meters ? Can I separate the IR LED from the receiver section ? Yes Sir. How can we practically increase the distance coverage of this circuit ? I am getting no answers to my questions.I have noticed resister 330 ohm among components list .It does not show on the schematic.kindly clarify this.How do you approve questions ?Thank you Dir. Follow the circuit diagram for making connections and selecting component values. I am not sure where you spotted a 330 ohm resistor only a 220 resistor is used for speaker.